** Lease Assist is an incentive available when you lease through Toyota Financial Services. Lease Assist include an amount on account of sales tax and is applied after sales taxes have been charged on the full amount of the negotiated price. Offers are subject to change without notice. † Cash incentives valid on retail delivery of select new unregistered vehicles when purchased and registered between April 2, 2019 and April 30, 2019. Cash incentives are comprised of a customer incentive and/or an incentive for cash customer. 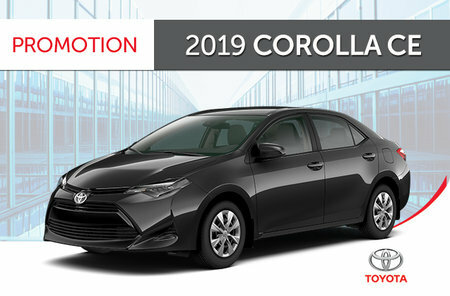 Incentives for cash customers are available for all Toyota retail customers except customers who lease or purchase finance through Toyota Financial Services at a special rate of interest offered by Toyota as part of a low rate interest program. All advertised lease and finance rates are special rates. Cash incentives (including incentives for cash customers, customer incentives, lease assist, finance assist and various other cash incentives that can arise from time to time) include an amount on account of sales tax and are applied after sales taxes have been charged on the full amount of the negotiated price. Offers are subject to change without notice. Quantities of certain vehicles are limited and dealer trade may be required. Dealer trade availability may also be limited and will vary by model. 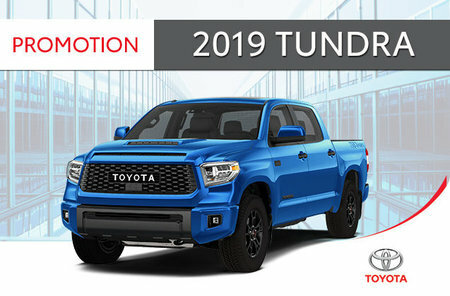 5 Limited time purchase financing offer provided through Toyota Financial Services on approved credit on new retail sales of qualifying models. Finance example based upon MSRP of $39,890.00 financed at 0.99% APR equals $1,002.42 per month for 36 months with $0.00 down payment or equivalent trade-in. Cost of borrowing is $544.95 for a total obligation of $36,087.12. Taxes, Freight & PDI of $1,745.00, Air Conditioning Charge of $100 (where applicable), license; insurance, registration and applicable duties, levies and fees are extra. Dealer may sell for less. Time limited offer at participating dealer. Offer subject to change/cancellation without notice. See your participating Toyota dealer. 5 Limited time lease offer provided through Toyota Financial Services on approved credit on new retail lease of qualifying models. Lease example based upon 0.99% lease APR for 36 months using a MSRP of $39,890.00. Monthly payment is $570.35 with $0.00 down payment or equivalent trade-in, $1,745.00 Freight & PDI, $0.00 security deposit and first monthly payment due at lease inception. Total lease obligation is $20,532.60. Taxes, Air Conditioning Charge of $100 (where applicable), license, insurance, registration and applicable fees are extra. 72000 kilometre allowance; charge of $0.10 for excess kilometres. Dealer may lease for less. Dealer order/trade may be necessary. Time limited offer at participating dealers. Offer subject to change/cancellation without notice. 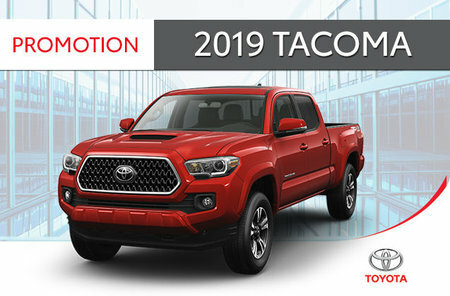 See your participating Toyota dealer.